When you rely on a small business for income, whether it is your sole income source or it provides a large percentage of your income, your divorce can be more complicated than a divorce between two salaried individuals. Your business or share in a business is considered to be a marital asset if it provided income to the household, even if you started the business before you were married. As such, it must be divided with your other marital assets during the divorce process. Before you have your business appraised and divided, determine your plan for its future. Depending on your spouse’s involvement in the business, this conversation might include him or her. Some former couples continue to successfully operate their businesses as co-owners after they divorce. Other couples opt to sell their businesses and split the profits. If you want to continue to operate the business on your own, you might need to “buy out” your spouse’s share of the business. To determine a fair price for this, an independent appraiser may be hired to determine the business’ market value. The court then determines a fair amount to assign to your spouse, based on his or her involvement in the business and how much of your marital asset pool was comprised of the business. The Asset Approach. With this approach, the business’ assets and liabilities, both tangible and intangible, are used to determine its fair market value. Intangible assets can include the business’ popularity with the local population and the skill of its workers, whereas tangible assets include the business’ operating equipment and profits. Your lawyer can help you find a knowledgeable, neutral valuation expert to value your small business. He or she can also help you determine which valuation method is best for your business, which can depend on your plan for its future and the level of involvement you and your spouse had in its day-to-day operation. 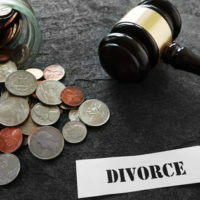 If you are a business owner considering filing for divorce, you need to determine your goals for the business after your divorce before you can determine how to value and divide it with your spouse. Our team of experienced Orlando divorce lawyers at the office of Goodblatt · Leo can discuss your goals with you to help you form a plan for this aspect of your divorce. Contact our firm today to set up your initial consultation with a member of our team.